The Tory MP launched a rallying cry to Brexiteers urging them to "showcase" all that is wrong with the European super state because Brexit is "under threat". She said: "I think we should do more to showcase and reiterate what is wrong with the EU, we do it anyway and in fact they do it for us. Every time when they belittle our Prime Minister, every time when a leader from another European country from not far away, across the water, that belittles our great country, our great nation, something which we would never do in return and yet we sit back and take it. "We have to give the British public confidence that Britain will make a success and can make a success of its future outside the EU. "We need to sure the British people know that of course it has a bright and prosperous future outside, as a beacon of free global trade. "A country that is open to markets, our friends in the commonwealth and growing and emerging countries around the world." The ardent Brexiteer said it was time for the EU to show "goodwill" and engage with Britain after MPs voted to send Theresa May's Brexit deal back to Brussels for renegotiations. t comes after Belgian MEP Phillipe Lamberts claimed Britain was "delusional" over plans to abandon the Irish backstop and to renegotiate the Withdrawal Agreement following last night's Commons showdown. 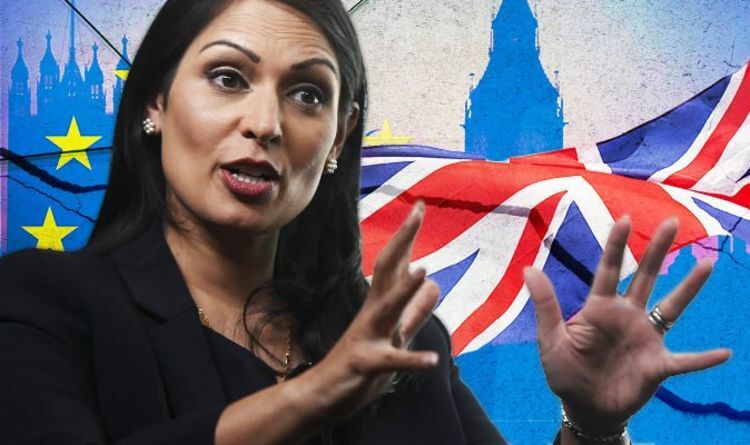 Responding directly to these comments, Ms Patel told the Bruges Group, a eurosceptic think tank in Westminster: "I think my message is very clear, that kind of intransigence is not going to get anyone anywhere. "They need to engage and I think it's fair to say, if you listen to the PM she's always spoken about the way she has approached the negotiation with fairness and with goodwill. "And now I think it's time for the EU and the Commission to demonstrate some goodwill themselves and engage constructively." She also warned that Brexit is "under threat", adding: "It is a sad and devastating reality of our politics, of the lack of trust in our political processes and of course the shameful lack of trust and respect in our democracy as well. "The hopes and dreams and the decision of the 17.4million are on the brink. "We need our government to believe in our country and Brexit". To a rapturous round of applause, Ms Patel said her constituents tell her: "We didn't vote for a Withdrawal Agreement, we voted to leave, now go back to Brussels and make sure we leave on March 29." The Tory ex-Cabinet minister also launched an attack on the "gloom-mongerers" who have claimed lettuce will run out in the event of a no deal Brexit, saying: "This is an insult to the people of this country."